Related video report by VOA's Zlatica Hoke. Louis Zamperini, an American prisoner of war in World War II and Olympic runner whose life inspired the book and upcoming feature film “Unbroken,” has died at age 97, Universal Pictures said in a statement. In May, Louis Zamperini was named the 2015 Rose Parade grand marshal. Zamperini died after a 40-day bout with pneumonia, his family said in a statement released by the film studio. "Louis was truly one of a kind," Universal Pictures said. "He lived the most remarkable life, not because of the many unbelievable incidents that marked his near century's worth of years, but because of the spirit with which he faced every one of them." Zamperini survived weeks on an inflatable raft and two years in captivity by the Japanese after his plane crashed during World War II. An American-born son of Italian immigrants, Zamperini competed in the 5,000-meter race in the 1936 Olympics in Berlin. Angelina Jolie, who directed the upcoming film based on Laura Hillenbrand’s 2010 book detailing his life, expressed her sadness about Zamperini's death in a statement released by Universal Pictures. "It is a loss impossible to describe," Jolie said. "We are all so grateful for how enriched our lives are for having known him. We will miss him terribly." 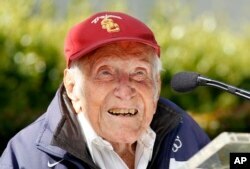 In May, Zamperini was named grand marshal of the 2015 Rose Parade, set for Jan. 1 in Pasadena, California.